October is Breast Cancer Awareness Month. Here’s a story of strength and survival from Diane Paloma, a leader in the Hawaiian community. Diane Paloma expected to get breast cancer. She just didn’t think it would happen so soon. Her maternal grandmother died of breast cancer when Paloma was a young girl. Her maternal aunt had breast cancer. Her other grandmother also died of cancer. Knowing her risk, Paloma did breast self-exams every month and got mammograms as recommended. Then, during a self-exam four years ago, she felt a lump that wasn’t there the month before. After getting tested, she got a call from her doctor, who delivered the news while she was driving to pick up her daughter from school. “I was facing a rock wall and the sun was shining on it. I remember the lighting, sounds, and smell as I was looking in the rear view mirror. It was like I was in a movie that I had no control over,” she says. She spent the next few weeks telling friends and family, including her three young daughters. “My husband, Jason, and I had to calm our own emotions before we told the kids,” she says. Paloma got a bilateral mastectomy, the surgical removal of both breasts. Luckily, she caught the cancer early enough that it didn’t spread. She didn’t need chemotherapy or radiation treatment. Surrounded by love. 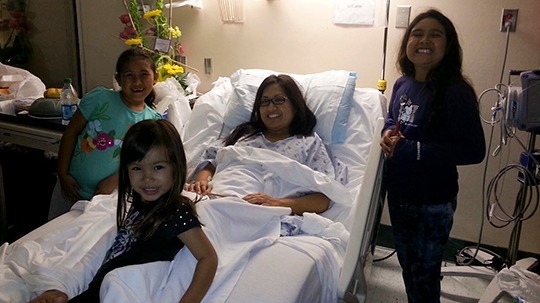 Diane Paloma gets lots of support from her three daughters while recovering from surgery. Paloma takes care of her health to prevent a recurrence. 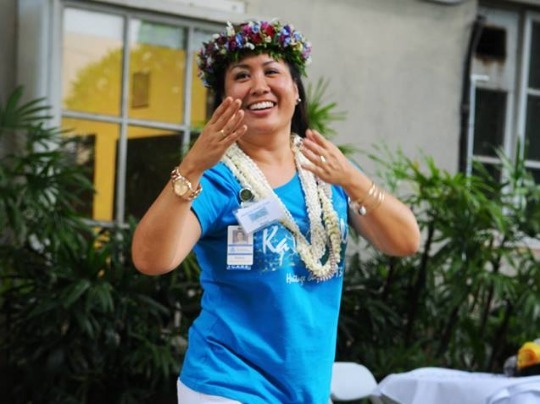 She exercises, is dedicated to hula, and has a strong support system of family and friends. She carefully balances her time between family and as chief executive officer of Lunalilo Home, which provides elder services to native Hawaiians. For Paloma, cancer prompted her to take more risks in both her personal and professional life. Lovely hula hands. Diane credits hula for keeping her grounded and healthy. Now 44, Paloma is in her fourth year of being cancer free. She’s happy to meet with other women with cancer to provide support and education.